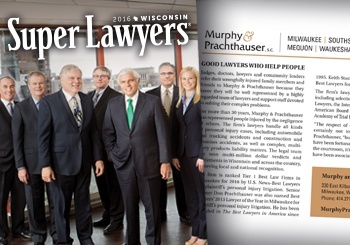 MILWAUKEE, Wis. - Murphy & Prachthauser, S.C. is pleased to announce that four of the firm’s attorneys have been named to the 2016 Super Lawyers list. Using a patented multiphase process, the Super Lawyers selection process includes peer nominations and evaluations combined with independent research. Each candidate is evaluated on 12 indicators of peer recognition and professional achievement with only 5% of lawyers selected overall. Selections are made annually on a state-by-state basis with the goal of providing a credible, comprehensive and diverse listing of attorneys that can be used for consumers seeking legal counsel. Super Lawyers lists are published nationwide in Super Lawyers Magazines and in leading city and regional magazines and newspapers across the country. The publications also feature editorial profiles of attorneys who embody excellence in the practice of law. For more than 30 years, the Milwaukee personal injury attorneys at Murphy & Prachthauserhave represented persons injured by the negligence of others. Murphy & Prachthauser practice personal injury law motivated and equipped to do their best for each client. They take pride in being good lawyers who help people and the firm's attorneys have won multi-million dollar awards or settlements for dozens of clients.